“New Work” features pieces by Chicago-area artists Annette Turow and Linda Robinson Gordon. The exhibition opens Sunday at the Evanston Art Center. Annette Turow and Linda Robinson Gordon have known each other for years and are even in the same Torah study group. But they are now connecting in a new way: through their art. The exhibition “New Work,” featuring pieces by both Turow and Robinson Gordon, opens Sunday at the Evanston Art Center. It is the first ever joint exhibition between the two Chicago-area artists, whose collaboration, Turow said, was partly inspired by the fact that their recent works express similar attitudes toward the world. Turow said the fully-abstract exhibition focuses on capturing feelings instead of trying to represent tangible things. She said she hopes audiences have a “positive emotional reaction” and take the time to deeply explore the details of the space. Turow’s portion features ink, oil pastel and oil stick paintings on plasticized paper called yupo. She said she was inspired by the journey of the Israelites in the desert, trying to imagine what it would have been like to be part of that experience through darkness and light, and visualizing that feeling through her work. Since childhood, Turow said, she was always sure she wanted to be an artist. After studying more “objective,” realistic styles in school, about 30 years ago she found herself turning toward abstraction. 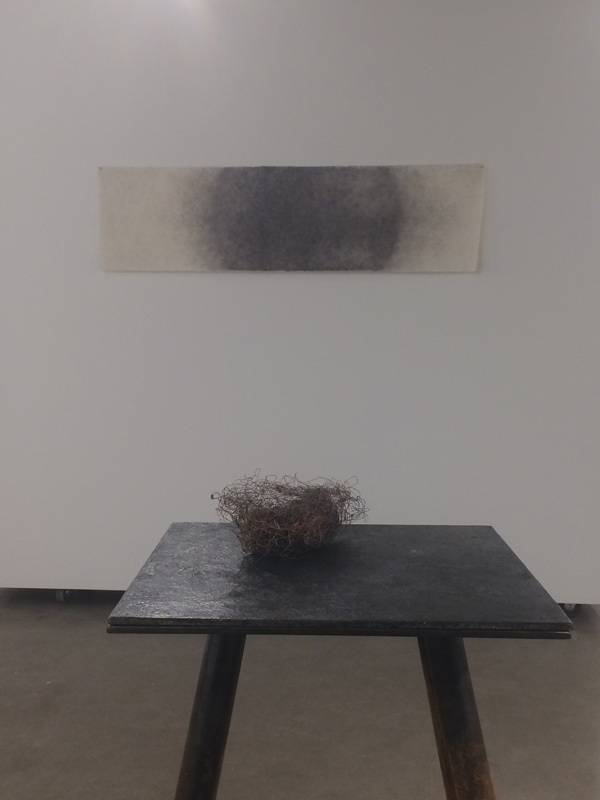 Robinson Gordon’s works in the exhibition include drawings on handmade Japanese paper, which involve numerous interconnected circles of crayon, ink and even mud. Mixed-media sculptures of mud, paper and copper wire further explore “a subtle beauty and delicate craftsmanship,” an Art Center statement said. Robinson Gordon said she grew interested in sculpture after her experience as a massage therapist, and fascination with the body, steered her toward more three-dimensional media. Usually, she doesn’t have a specific idea in mind when she begins a piece, but instead lets the material guide her, she said. Though the two artists have distinctive methods, Turow said she believes they reflect similar attitudes and come from a place of spirituality. Turow described her own style as “large and loose” and said Robinson Gordon’s were more “small and precise.” However, Turow said, the exhibition still feels cohesive, and all the works use a similar color palette. Cara Feeney, the manager of exhibitions at the Art Center, said the two artists’ works intermingle to create a high quality exhibit. Robinson Gordon said she is excited to see how her work looks in a space outside the studio alongside Turow’s pieces. Turow said she believes that art is valuable in encouraging communication and emotional intelligence. She described art as “an experience outside of words” that provides a new way for people to connect with each other.